Brazil's President Jair Bolsonaro speaks as he attends the World Economic Forum (WEF) annual meeting in Davos, Switzerland, January 22, 2019. 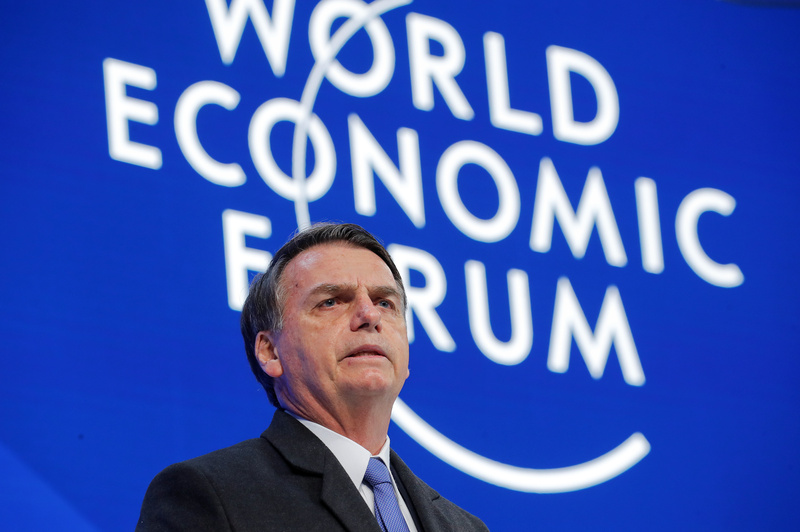 Brazilian President Jair Bolsonaro told the World Economic Forum in Davos on Jan. 22 that he was building a “new Brazil”. He promised to reduce the tax burden, cut red tape and to open up an economy that remains “relatively closed”, but gave few details. He did not mention pension reform, one of the key problems his administration has vowed to tackle. Bolsonaro’s trip to the annual gathering is his first overseas outing since taking office on Jan. 1, and his speech had been one of the event’s most anticipated. Brazil’s delegation at the Davos includes Paulo Guedes, “super minister” for the economy, and Sergio Moro, justice minister and former driving force of the country’s anti-corruption investigation.